Dr. Adelson is currently the only fellowship trained rhinologist in the greater capital region; he is one of only a few subspecialists nationally who have completed separate fellowships both in facial plastic and reconstructive surgery as well as rhinology. He combines both areas of interest in a practice limited to medical and surgical management of disorders of the nose, sinuses and skull base. 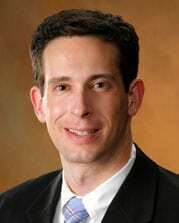 Dr. Adelson’s particular areas of interest include medical and surgical management of chronic rhinosinusitis, endoscopic sinus surgery, cosmetic and functional rhinoplasty, frontal sinus surgery and management of skull base disorders.